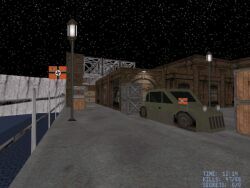 Description: This map was built years ago for some Polish WW2 TC. The TC died but the map didn't and during the past few months/weeks/years LAW has given the map a heavy graphical/gameplay update. It has been heavily influenced by Wolfenstein/WW2. There's some new monsters. Design: The level is quite big and manages to offer plenty of variety. There's a railway station, a power station, a dam, submarine docks and so on. Texturing is mostly good and trimwork at least mediocre. New art is mainly from Wolfenstein and there are some ww2 posters around. However, the level is a bit too bright. It's supposed to be night but even the indoor areas, caves with no light sources, are overly bright. There's a good looking power station with some good architecture and "transparent" water but the whole room is overly lit. As for the rest - outdoor areas stand up as the best looking parts of the map. Gameplay: The gameplay is a whole new deal with all new enemies and arts. It's not quite as action filled as Duke maps - mainly due to the fact that the enemies are not that convincing. They do work pretty well and fit with the overall theme. There are some good new ambient sounds and most of the level's puzzles are good although there's a bit of backtracking. There's quite a lot of variety which always spices things up. The "War Machine" - tanks, planes etc. are basic sprites but they're well scattered around the map - mostly located in unreachable sectors which make them look pretty good. The fight near the end is a good one. Innovations: Hardly anything new or innovative but you haven't seen too much of these Wolf/WW2 maps made for Duke. Conclusion: The set of new Wolfenstein stuff (monsters and arts) might or might not appeal to you but the architecture offers some pretty good looking constructions and plenty of variety. Just too bad that it's a bit too bright and "quiet".